Times change, and with that comes a changing of the guard. The current roster of Avengers and Marvel heroes cannot maintain their respective roles forever, and with that in mind the third phase of the Marvel Cinematic Universe has started to bring new heroes into the fray. One character that hasn’t debuted yet in the MCU is Namor the Sub-Mariner, despite the fact that he’s a fan favorite. The rights to the aquatic-themed character recently returned to Marvel, and one Teenage Mutant Ninja Turtles actor wasted no time starting his campaign to nab the role. This is what: Just saying, Marvel Studios just picked up the rights to Namor, who is the Sub-Mariner, and I would love to play the Sub-Mariner. I grew up as a comic geek and the Sub-Mariner is one of my childhood's fondest superheroes. I feel like I can play him! If there is one role, right now, that I would love to play, it would be Namor. As far as the casting process for Namor goes, Marvel Studios could do a whole lot worse than Brian Tee. His career as an actor has more or less been characterized by highly physical, big budget action roles, and he’s no stranger to the comic book genre as a whole. Marvel would have to throughly vet him, but upon first glance, he has a strong enough resume to at least be considered. Then there’s also the simple fact that he most certainly looks enough like Namor to take on the role. Additionally, casting Brian Tee in this particular role would also seem to line up with Marvel’s recent endeavor to try and add some diversity to its ensemble of lead heroes. With the addition of characters like Black Panther and Captain Marvel, Marvel clearly has made some earnest attempts to try and steer away from exclusively using white male superheroes. 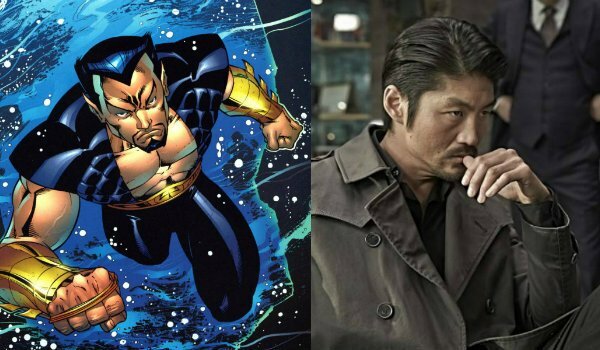 If they opt to consider Brian Tee for Namor the Sub-Mariner, it would help address the growing concern over availability of roles for Asian actors – a topic which recently became a hot button issue in Hollywood. But at the end of the day Marvel has only just gotten the rights to Namor back. Although fans have clamored to see the character brought to life on the silver screen, there’s no guarantee that the studio has any intention of doing so in the near future. That being said, considering the amount of fan enthusiasm that exists for the project, it would be foolish not to at least consider fast tracking a Namor solo film. We will keep you updated on the potential Namor movie as more information becomes available to us. For now you can check out Brian Tee as Shredder in Teenage Mutant Ninja Turtles: Out of the Shadows.